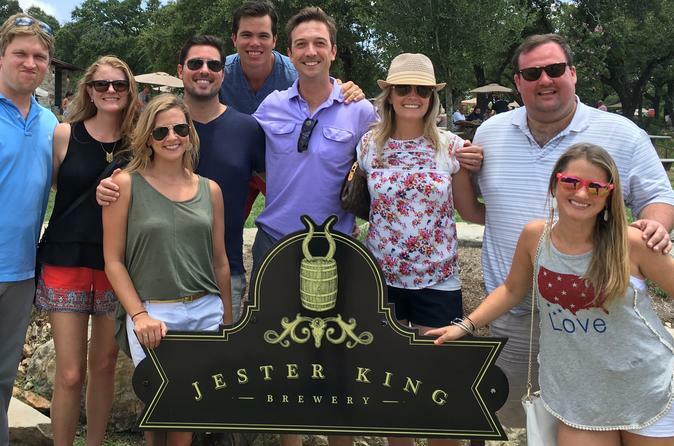 Our Texas Hill Country tour features the award winning Jester King Brewery. We drive 30 minutes west of town to the scenic Hill Country. Enjoy tastings and the scenic Hill Country on our 4 and a half hour tour. We visit Jester King Brewery and Last Stand Brewing in Dripping Springs and finish at St Elmo Brewing in south Austin. The tour runs Saturdays and Sundays, starting at 11:30 am and finishing at 4:30 pm. A friendly and knowledgeable guide will be with you the whole tour. Tours are all-inclusive. We cover transportation, tastings, facility tours(brewery permitting), and tipping the bartenders. Driver gratuity(10%) is NOT included. All tours start and finish at Craft Pride at 61 Rainey ST. Please arrive 10 minutes early as vans leave promptly and on time. Food is available for purchase at the breweries. Parking at Craft Pride is tight we recommend walking or Uber or Lyft for safety. Craft Pride will not be open, but there are tables and chairs out front to wait at. Look for the big white Ford van.